2P START! Live! 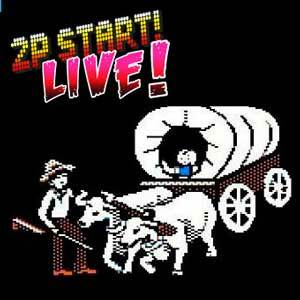 : Dysentery Edition | 2P START! In this episode, Tim and Ray discuss The Oregon Trail and the surprising response to the comic. Plus you’ll get Black Doom, Suggestion Box, Musical Misfits, and more! This is a short, good, and solid podcast – so this is a pristine chance to jump in and try out our podcasts if you never have before. The remix is pretty sweet. One of the first one’s I’ll actually take the effort to click and download (I know, I know, I’m lazy)… except the download link from YouTube isn’t working. Darn. New comic talk music. I like it. It’s swingin’ and hip. This comic hit me with nostalgia and that’s why I loved it. And I am younger than you, but Oregon Trail was around in the 90’s (although it was a slightly updated version to the one you posted). More zombies?? They’re so many. Just watched the trailer. And do you really want to hear the voice? Honestly, I prefer my ears remaining intact. And they won’t kill off Sonic because he sells. Tis sad, yet true. I agree that Sonic is dead. He was made to compete with the face of gaming himself: Mario. And Sega tried this by making Sonic cool and edgy. But the meaning of those words have changed, and Sonic hasn’t. Then again, I’m sure the old fans would hate to see their old Sonic change to keep up with what’s cool… Sega should’ve just chosen a more timeless design for Sonic. Where and how can I suggest a musical misfit? It may be shorter, but it isn’t lacking content, Just like those tinier laundry detergents, just more concentrated. The remix seemed a bit biased, since Ray is a big Brawl nut. I’m twenty, so I got to play both versions of the Oregon trail. Y’mean ACHIEVEMENTS? 😉 Another mention of Tim’s elusive brother, I see Eddie so much and not Tim’s elusive brother… C’mon, I need the Waluigi to Ray’s Luigi (Eddie)!! We have the technology, we can rebiuld him. BIONIC HEDGEHOG! 2. Ever think of a section in Rise From Your Grave for podcast comments? 5. Technically, Ray, you’ve only said the suggestion box intro 62 times, not 63 (w00t! More nitpicking!). a. Get rid of all the human characters but Eggman/Robotnik. b. If they want to add more characters other than Sonic, pull from the list of characters in Sonic Adventure 2. 1. Was that K.K. Safari I heard the intro? Ever think of a section in Rise From Your Grave for podcast comments? Do you mean talk about the comments left about the podcast? If one is golden enough we’ll use it for suggestion box, but I don’t plan on having a segment dedicated to it though. We do read every comment left here. I especially enjoy the note-taking ones, as they will comment on quick little jokes made that are quickly forgotten. C’mon, I need the Waluigi to Ray’s Luigi (Eddie)!! Nice comment – Eddie tends to choose Luigi as his playable character. Correct – it is used multiple times. I wish I could play them all, but the intro one had to suffice. Thanks for your picks of favorite songs. At first I was rather taken back by the music in Paper Mario: TTYD, but now I’m very impressed with it. The composer was doing much more with it than I first realized. My other favorites have to be Tec’s Waltz with Peach, the full title screen song, the Doopliss songs, the train song during sunset, and especially Peach’s theme. It’s the most fitting theme for Peach I’ve ever heard – and very memorable. They need to keep these melodies around for future Paper Mario titles, but unfortunately Super Paper Mario did not. You didn’t list my Black Doom award I suggested! Waaaaaaaah! The Oregon Trail is a classic game that everyone has heard of. I mean, this was a really awesome (and original) idea for a comic, and it was overall really well done. Finally, Nice Podcast Guys! It was a nice, bite-sized podcast, but still managed to be quite good. And I liked how in the Musical Misfits, you got to hear the sound of pages turning every so often. Is that part of the song? Or is that directly from a cutscene? Sorry, I never got around to getting TYD. Yeah, that was probably the only one that I would’ve recognized as it’s easily my favorite K.K. song. Do you mean talk about the comments left about the podcast? I especially enjoy the note-taking ones, as they will comment on quick little jokes made that are quickly forgotten. My other favorites have to be Tec’s Waltz with Peach, the full title screen song, the Doopliss songs, the train song during sunset, and especially Peach’s theme. It’s the most fitting theme for Peach I’ve ever heard – and very memorable. They need to keep these melodies around for future Paper Mario titles, but unfortunately Super Paper Mario did not. I can’t say I remember any of those songs, I’ll have to look them up, I’ll probably recognize them then. And yeah, I can’t say I remember any of Super Paper Mario’s music…ah well, at least it had humor on it’s side. Is that part of the song? Or is that directly from a cutscene? Sorry, I never got around to getting TYD. That’s needs to be remedied. XD I’m pretty sure it’s players choice now, so it should be cheap. Heck, I could have picked that game up many times. I just feel like playing the original Paper Mario first. I think I got it on VC and never actually played it… I’ve been really busy with my other games lately (I blame Viewtiful Joe :P). Hooo boy. Great, now I’ve hyped it up as the best game ever, I’m going to warn you now. Do not go in thinking it’s going to be the best RPG ever. It’s great fun, but it’s aged, don’t forget that. Don’t be like me. XD But still, you really should play it…like now. First off, yes you said my name perfectly. No the penny arcade in 2pstart is coming out ( a game they want to make) NO!! Also last weeks comic proves that Comics in which Tim Dies= Awesome ….also More D3vin. yes, i agree, that the 1st two paper marios need to be played by all. Also, I just kinda thought about this, but Ray, have you ever thought of doing video reviews? I think those would be pretty awesome, though that would probably take up a lot of time. More me? Gee, thanks hard to pronounce symbol so I will just say The Poster Formally known as Bulimic Koala 😉 I am working on a new comic, but m progress is slower since I use different means of doing it. Gotta say I was shocked. I could have sworn you guys would have taken the Black Doom to Nintendo’s doorstep when they claimed 99% of the industry growth is theirs…. I come from the grave to tell you, MY black doom is Star Wars Battle Front III. I love the series, I hope someone picks it up! Great comic guys one of my favorites! Nice display picture, i have that as my wallpaper. I’ve done one once or twice. Ok, well, maybe once actual but a couple other times in my head where there wasn’t much point in actually commenting because other people had similar thoughts. B – Yeah, kinda missed having a third person. I was starting to expect Eddie to show up in the comic at some point. I mean, you did mention something about expanding your cast of characters at some point, right? D – Commenting incentives, eh? hmm…. dying of curiosity now. I’ve done one once or twice. Why not just use Notepad or something? Or do you listen to the podcast on an iPod away from your computer? Hope you guys don’t have a time limit for your songs, though. Because this theme is 5:44, with no loops. Just make it clear, and throw me a link of the actual game’s recording if possible. Hmmm… This is why I wasn’t sure about how to request something. Doesn’t posting a link to the song beforehand kind of ruin the magic? More me? Gee, thanks hard to pronounce symbol so I will just say The Poster Formally known as Bulimic Koala I am working on a new comic, but m progress is slower since I use different means of doing it. True Ray is too afraid of teh paperz. On IGN’s site, where they have the link to the new Black Knight trailer, the subtitle is “Better than Unleashed?” I bet that will get the next Black Doom Award. Ray, I’ve given it some time, but you appearently haven’t noticed the Sonic CG movie. Night of the Werehog? Was in Nintendo Power? Has Chip in it? I really thought this would have been the podcast that you’d make it your Black Doom Award. Nice podcast though. Hi, Betta splenden. Yes, I had seen Night of the Werehog in November or December, I believe. It was a cool little short with impressive visuals. I just felt like it was a total waste of talents. Why not take all that effort and put it into a 10-min long CG short Sonic fans would actually care about? Or add a few more amazing cutscenes to Unleashed. They have the talent for these things – they just need to know where to put it. I’ve watched the first 12 or so podcasts, and I’d like to actually see some of the comments used for the suggestion box without trawling through hundreds of pages of blog to find them. Is there anyway you could get a link to those comments and put them under the podcast in the podcast section?